When Brenda Ahenakew was in Grade 12, her mother Freda jumped on the bus with her and joined her in all of her classes. “I’m sure there were some eyebrows raised in the little town of Marcelin where we went to school, but we didn’t care,” Brenda said. There were 10 of Freda’s children on the bus. “We just about filled it ourselves” said Brenda. The youngest child was just starting Grade 1 at the time, and Freda felt the time was right to uphold the Ahenakew family’s dedication to education. Freda Ahenakew, born on the Ahtahkakoop First Nation in Saskatchewan in 1932, had strong reasons for going back to school. She saw her children losing interest in their education and wanted to be a role model for them to finish Grade 12. 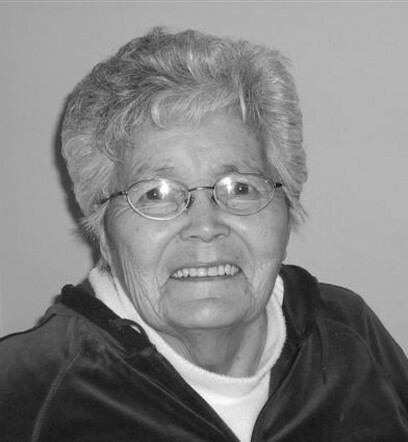 Plus she had always wanted to finish high school herself, having dropped out in her final year around 1950 to marry Harold Greyeyes and move to his home at Muskeg Lake First Nation. “Mom’s favorite great uncle was Edward Ahenakew. He was one of the guys who rallied our people to form the National Indian Brotherhood,” Brenda explained. Her mother saw how crucial education was in her relative’s ability to speak up for and organize Aboriginal people to influence social and economic matters affecting them in a fast-changing world. Freda would apply the same tireless devotion to her schooling as she did to raising her family. She went on to receive a Master of Arts in Cree Linquistics. As a single mother of 12 children, she raised cattle, pigs, chickens and turkeys; and tended acres of garden to put carrots, turnips and potatoes in the root cellar to round out family meals. “We always ate well,” Brenda said, recalling how good her mother’s homemade butter tasted on the bread she baked. If Freda wasn’t milking cows, weeding the garden, cooking or baking, she was at the sewing machine. “She was always making dresses for us girls and one time someone gave her a woman’s fur coat. She cut that down and made two little coats for my brothers. They were probably four and five at the time, and they looked so cute. They wore them all the time. “Mom was practical. We were poor and didn’t have much, but she was always able to make something out of nothing and we survived. “And there were always extra kids around. One time she inherited 15 children after their parents—one of whom was Freda’s cousin—were killed in a car accident. After turning her sights toward education and graduating with her Grade 12 diploma, the next educational hurdle Freda cleared was obtaining her Bachelor of Education degree in 1979. She stepped into the classroom after that, teaching at the Saskatchewan Indian Cultural College, a school on the Lac La Ronge First Nation, and the Saskatoon Survival School until 1981. In 1984 she received her Master’s in Cree Linguistics from the University of Manitoba. From 1983 to 1985, she was an assistant professor at the University of Saskatchewan, and from 1985 to 1989, she was the director of the Saskatchewan Indian Languages Institute. She taught as a professor of Native Studies at the University of Manitoba between 1989 to 1996, first acting as associate professor of the program, and then head of the department. Heeding a call to return to Saskatchewan, she worked as a First Nations Language Consultant to the Prince Albert Grand Council until her retirement in 1997. In her academic life, Freda helped lay the foundation for preserving the oral traditions of her Cree people, writing books, developing literacy curricula, and tirelessly teaching the Cree language to generations of students. Her published thesis, Cree Language Structures, has been reprinted 18 times and is a unique guide to the teaching of an Aboriginal language through the use of literary texts. Language was definitely her passion, and for that she’s been recognized with awards and honorary degrees from Saskatchewan and Manitoba universities, but she never laid much claim to those. What did motivate her was capturing and sharing the lives and language of her people, especially the seldom heard stories of Cree women. Her books Kohkominawak Otacimowinawawa (Our Grandmothers’ Lives told in their own Words), and Kwayask e-ki-pe-kiskinowapahtihicik (Their Example Showed Me the Way: a Cree Woman’s Life Shaped by Two Cultures) are highly regarded. In her children’s books like Wisahkecahk Flies to the Moon and How the Mouse Got Brown Teeth, Freda shared Cree language and traditional stories with grade school students. Because she wanted her people to have effective health care, she also edited a collection of Cree medical terms for physicians. But rather than keep all those wonderful stories to herself, Freda transcribed, translated and analyzed them to ensure Cree culture and language would be preserved for future generations. The internationally recognized scholar, and holder of the Order of Canada, passed away from complications of diabetes at Muskeg Lake First Nation in Saskatchewan on April 8, 2011 at the age of 79. Freda Ahenakew had 55 grandchildren, 75 great grandchildren, and one great, great grandchild.